↑ Michael Redhead, From Physics to Metaphysics, Cambridge University Press, 1996, p. 15. ↑ Adams, I.; Dyson, R.W., Fifty Major Political Thinkers, Routledge, 2007, p. 196. "He became a British citizen in 1945". 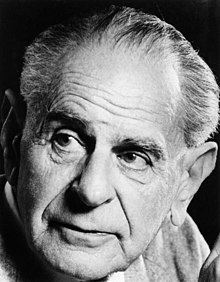 ↑ Manfred Lube: Karl R. Popper – Die Bibliothek des Philosophen als Spiegel seines Lebens. Imprimatur. Ein Jahrbuch für Bücherfreunde. Neue Folge Band 18 (2003), S. 207–38, আইএসবিএন ৩-৪৪৭-০৪৭২৩-২. 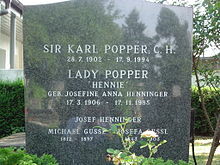 ↑ "Sir Karl Popper Is Dead at 92. Philosopher of 'Open Society'"। New York Times। ১৮ সেপ্টেম্বর ১৯৯৪। সংগ্রহের তারিখ ১৫ নভেম্বর ২০১২। Sir Karl Popper, a philosopher who was a defender of democratic systems of government, died today in a hospital here. He was 92. 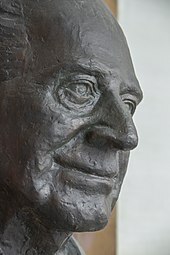 He died of complications of cancer, pneumonia and kidney failure, said a manager at the hospital in this London suburb.